grep command is for the program for usage in command line for UNIX and and Unix derivatives which is used to search and filter strings from from a junk of files.It was originally developed by Ken Thompson in 1973. The term grep stands for g lobal / r egular e xpression / p rint or g lobal search for a r egular E xpression and p rint out matched lines : “global search for a regular expression and print matching lines.” Historically, the name grep or grep command evolved from the command g / re / p from the standard UNIX editor ed. There are many variants such as egrep, fgrep and agrep. In other words, you can search for a file, a folder, a word inside a text file etc. Regular expressions can be used with grep command. Output can be saved as usually. It will not only show the locations but also tell me whether they are directories or files. This is useful if you can not find a folder on server. In WordPress forum, new users often asked to locate the php log folder – they asks as cross question – where is log folder ? The ‘WordPress Developers’ has excellent knowledge (pun intended), they replies – “ask your webhost”. You can simply put a php script to find the log folder – grep command can be scripted and not necessarily needs shell access (like curl, wget etc.). Technically it can be used for searching webpages creating a script. Note : recursive (-r) should be added to searching the directories. The above is a simple example. This Article Has Been Shared 2604 Times! List of Indispensable OS X Commands lists some important commands for the newbies to Apple Mac OS X 10.8 Lion. This is a small list of commands normally used. WordPress Command Line Tool can be installed on any UNIX or UNIX Like OS. The usage ranges from installing a plugin, Publishing Post to anything you want. 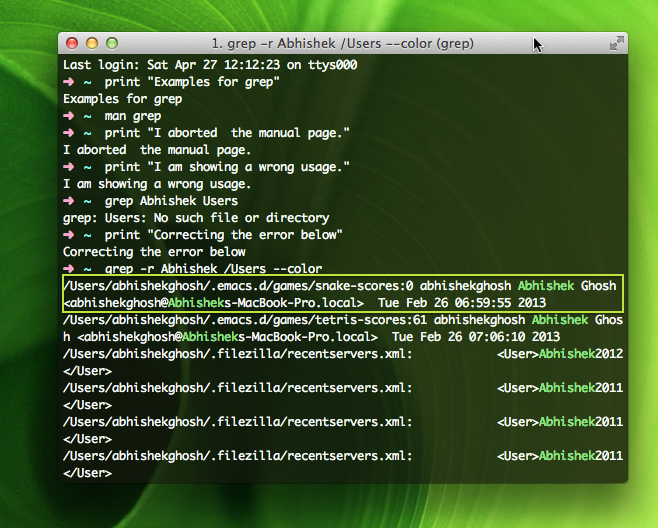 Cite this article as: Abhishek Ghosh, "grep command : Details, Examples and Usages of Grep Command," in The Customize Windows, April 27, 2013, April 18, 2019, https://thecustomizewindows.com/2013/04/grep-command-details-examples-and-usages-of-grep-command/.